The diagram below shows a regular hexagonal prism (not to scale). Each side of the hexagonal faces has a length of 1 unit. The height of the prism BP is equal to the length BQ. 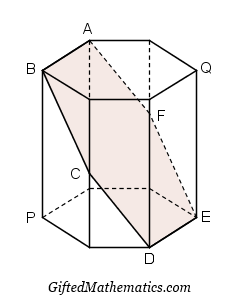 A slice is taken across the prism in such a way that the plane includes the line segments AB and DE. This plane also cuts the prism at points C and F. The intersection of the plane and the prism forms another hexagon ABCDEF. Find the area of the hexagon ABCDEF.